Experience art along a 3-mile hike with stunning alpine lakes, a cathedral of pines and breathtaking vistas. Many of us have hiked in the High Sierra or stood on elephant-size boulders, whose concrete skins are soaked in sun-heat and whose flatness lends way to a dust-free resting spot. We have walked for miles aside an ocean, ran through fields of bending grasses, wandered through old-growth forests. All of these experiences shape memories in one’s hearts and minds. Add art to the experience, and you have Trails & Vistas art hikes. On Sept. 7 and 8, explore Trails & Vistas 10th anniversary art hike “Reflections” along a beautiful stretch of the Pacific Crest Trail. Expect stunning performances in the mountains. With every step, feel the snares of the world breaking away to experience the perfect blending of nature and art. Discover hidden dance and music performances behind mighty pines whose needles appear to dance with each song. Hear a variety of storytellers, dancers, flutes and drums that collectively and individually honor art in nature. Step aside and let the songs release emotions that leave one peaceful, joyful and appreciative of the present moment. The art hikes seek to fuse the beautiful landscape with stellar artistic experiences and performances. Every year, dozens of artists come together to bring awareness to the environment and celebrate the importance of arts and culture. Each hiker is encouraged to slow down, read the poetry hanging from the limbs, touch the trunks and bark, close one’s eyes to enjoy a ballad or poem, breathe deeply and listen for the language of Nature. There are a dozen sites along the earthen trail starting at 7,000 feet and reaching spectacular reflections at Lake Flora. Nancy Tieken Lopez, creator and executive director of Trails & Vistas, takes participants outdoors to experience art in a new way, to breathe in the cool, pine-scented air. 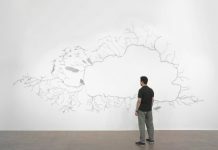 While in graduate school at San Jose State University, Tieken-Lopez came up with the idea to cross-pollinate art and nature. She brought her bronze-cast metal sculptures into Alum Rock Park in San Jose and watched hikers stop to look at them. “I would go along the trail with my art and interact with random hikers,” she says. “What came out of it was this great dialogue, audience and a new way of thinking about art and community.” The first art hike was created for her thesis project in 1994. 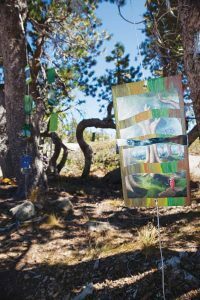 A few years after Lopez moved to Truckee, she expanded the art hike idea to form Trails & Vistas with Elizabeth Archer from InnerRhythms in 2004. 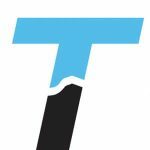 They partnered with the Truckee Donner Land Trust and later added the KidZone Children’s Museum to the partnership. Nine years later, more than 700 people have attended the sold out art hikes each September. Trails & Vistas invites participants to turn off and step away from technology for a few hours, and completely immerse oneself in the experience of art in nature, an opportunity to connect with the natural world and one’s creativity. “We have been lucky to work with so many talented artists over the years,” said Tieken Lopez. 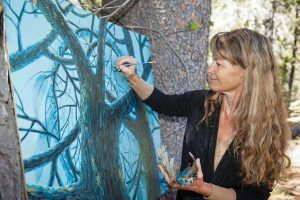 At least a dozen artists are returning to Truckee Tahoe to honor the past art hikes and celebrate Trails & Vistas 10th year anniversary. 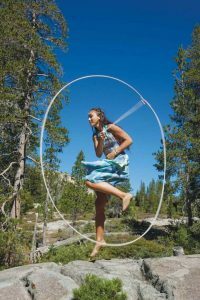 Over the years, Trails & Vistas participants have hiked tens of thousands of footsteps in California and Nevada: Azalea Lake, Donner Ski Ranch, Gregory Creek Canyon, Shirley Canyon, Spooner Lake, Tahoe Donner, Squaw Valley and Summit Lake. 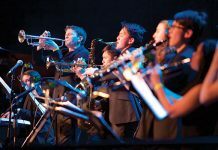 The 2013 theme is “Reflections.” As part of the milestone year, Trails & Vistas also will be offering a nighttime concert at the Truckee Amphitheatre on Sept. 7 (see Entertainment in this edition). The concert highlights a variety of music styles from Trails & Vistas featured visiting artists. Attendees will enjoy the visually dynamic double-neck guitarist Ian Ethan Case from Boston, as well as Japanese Taiko drummers from Reno, Nev., and the 40-piece San Jose State Symphony Orchestra. The concert opens with award-winning World Flutist Ann Licater from Los Angeles. Gates open at 5 p.m., and music begins at 6. Trails & Vistas ticketholders receive a 50 percent discount for the concert when purchasing art hike tickets and concert ticket together ($10 for the concert). The general admission cost is $20 in advance and $30 at the gate. “The art hikes are a journey of art in nature that fill us to the brim with an awareness and serenity and leaves us searching to hear more, see more and feel more,” shares Tieken Lopez. Performances weave seamlessly around the boulders, into the trees, taking advantage of nature, while becoming, it seems, nature itself. Participating 2013 artists include internationally acclaimed Angelika, who sings songs in ancient Sanskrit with healing chants and mantras, and Ian Ethan Case, a musician of the double-neck guitar and African Kalimba with rhythmic and melodic sounds that are both innovative and deeply rooted in tradition. InnerRhythms Dance Theater, a Trails & Vistas partner, has been with Trails & Vistas art hike every footstep along the way. “We proudly support this annual event. We believe that the arts transform the human experience, that art is a gift to be shared,” explains Elizabeth Archer, InnerRhythms executive director. 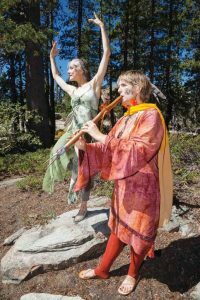 InnerRhythms Dance Theater presents young local talent, graceful and classically trained dancers who grew up playing in the woods and are now performing ballet amongst the towering pines under the magnificent Sierra sky on Donner Summit. KidZone Children’s Museum, another partner of Trails & Vistas, has supported the art hike by hosting artists for children’s enjoyment. Carol Meagher, executive director of the museum, says that one can never start too early inspiring young minds through creative play and discovery. “This unique, imaginative event is core to our mission,” she said. Children are welcome at the event; in fact, there are hikes designed for adults and their little ones. Guides will lead the three-hour long hikes including nearly a dozen featured stops. Hikes are offered every 15 minutes from 10 a.m. to 12:30 p.m. on Saturday and Sunday, and include no more than 26 people per group. Hikers should be comfortable traversing over terrain at high elevations. Specialty hikes include family hikes for those hiking with children, meditative hikes for those seeking an especially quiet and spiritual connection (adults only), and leisurely hikes for those needing a slower pace. Tickets are $30 for adults and $10 for children. Advance purchase is highly recommended because the event sells out every year. For more information or to purchase tickets for the art hikes or the concert, visit trailsandvistas.org. 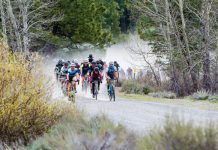 Article courtesy of Trails & Vistas. Sept. 7 | 6 p.m.